Are you interested in generating power from solar, wind or another renewable energy source at your home or business? Learn more below. Here’s a printer-friendly version of the information below and our Solar Power Options. Will on-site generation lower my electric bill? The monthly electric bill for homeowners who install solar or wind may be lower because of the energy they receive from their system. But solar and other renewable generation systems can be a large investment, costing thousands – often tens of thousands – of dollars. So, while your electric bill may be lower each month, you won’t see a true return on your investment for years down the road. For example, if a Boise residential customer uses an average 952 kilowatt hours (kWh) a month and installs a 6-kW solar system, it could take 14 to 18 years to recover his or her initial investment in solar. Additionally, there are different payment options for solar, including paying cash upfront or financing plans that include interest. Typically, any time a large purchase requires making monthly payments, interest charges are included. Adding interest increases the total cost and length of time to recoup an investment. I’ve heard a typical payback for rooftop solar can be 10 years or less. Is that true? Idaho has some of the lowest electricity prices in the nation, largely due to our clean, low-cost hydroelectric system. In states where electricity is expensive, an investment in solar on-site generation can have a quicker payback. In California, for example, solar install prices are only slightly higher than Idaho’s, but their electric utility prices are significantly higher. Therefore, residents of California who choose to install solar can start saving money in less than 10 years. Idaho Power customers enjoy lower electricity prices, which usually means a much longer period to recover an investment in solar. 1Find descriptions of simple savings and net present value under the question Why does Project Sunroof provide two different 20-year values? at idahopower.com/solar. 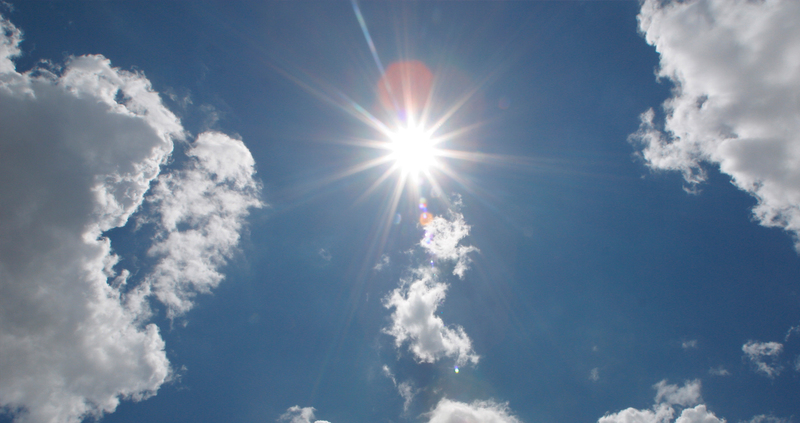 What factors affect payback for a solar on-site generation system? Many factors can affect the payback, including the installed cost per watt of the system, system design and energy production, and tax credit eligibility. A system’s energy production depends on the technology used, how the system is configured, as well as environmental factors. Wind production is affected by location, turbine height, and obstacles that interrupt wind flow, such as nearby structures or trees. Solar production is affected by the direction and tilt of the panels and shade. Another factor is electricity price changes. Prices fluctuate slightly year to year due to inflation, fuel costs, and other factors. In 2018, Idaho Power customers experienced a decrease in electricity costs. Looking forward, Idaho Power’s most recent Integrated Resource Planning (IRP) report estimates that relative fuel prices will increase, on average, 1.2% per year over the next 18 years. Will solar or other renewable generation keep my power on during a power outage? Having power when the grid is down generally requires battery backup. Inverters are the part of a typical solar system that convert DC power to usable AC power. The vast majority of inverters are grid-connected and work only if the electrical grid is functioning normally. If the grid experiences an outage, the inverters sense the abnormality and will stop interacting with the grid. This helps keep work crews safe and the grid stable. A small number of customers connect to the grid and have a battery backup. This allows them to use energy stored in the batteries while the power is out. Battery backup systems will add significant cost to the overall system. If I install solar or wind, do I still need power from the utility? Most homeowners with on-site generation connect to Idaho Power’s electrical grid to ensure reliable, consistent electricity. The wind doesn’t always blow. Solar panels only produce when the sun is out. Even then, the panels may not produce enough energy to meet the home’s energy needs at all times. The grid lets solar customers draw power at night when there is no sunshine, during a cloudy day, or any time they need more electricity than their system is generating. Also, most customers with on-site generation rely on the grid for the rush of power needed to start up large appliances like air conditioning units. Without the grid, the average solar or wind generation system can’t supply enough instantaneous power to turn on these large appliances. For these reasons, homeowners with on-site generation rely on Idaho Power’s electrical grid every hour of every day. 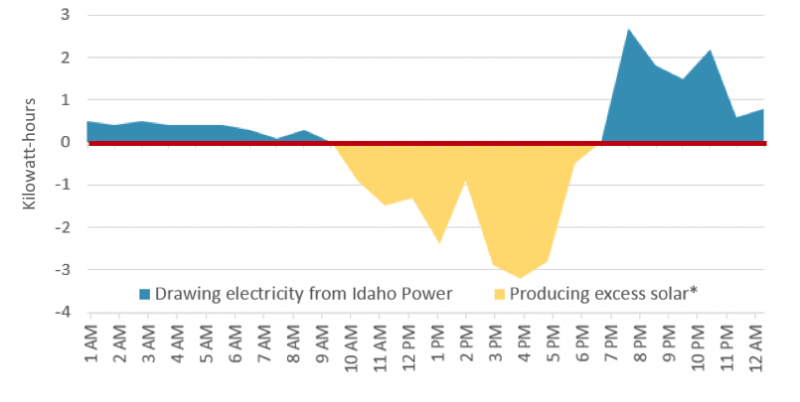 The following graph shows a full day’s meter readings for a sample home with an on-site solar generation system connected to Idaho Power’s electric grid. One example is from August when the days are long and solar panels are at their peak generation. The other example is from January, when solar panels typically produce less than half the energy than they do in July and August because of the shorter days in winter. The red line indicates zero kilowatt-hours. The yellow shading shows the times that the home’s solar is generating more energy than the home is using. During this time, excess energy is delivered to the grid. The blue shading shows when the home needs more energy than solar can provide, and the home is drawing energy from the grid. *For simplicity, the chart shows a pure yellow color. However, the home may still rely on the grid even when solar is at its midday peak. For example, when a cloud goes by or a large appliance needs a boost, the grid is there to meet the home’s energy needs. Hourly kilowatt-hour meter read on a long and hot summer day. Hourly kilowatt-hour meter read on a winter day with shorter daylight hours. What type of renewable on-site generation systems are allowed? Currently, solar photovoltaic (PV) is the most common choice for those who generate their own renewable energy. However, Idaho Power’s net metering and on-site generation tariffs allow customers to connect solar, wind, small-scale hydro and other renewable technologies. Learn more at idahopower.com/CustomerGeneration. For a solar array, each kilowatt (kW) of solar photovoltaic generation capacity requires about 100 to 200 square feet of roof or ground area depending on the efficiency of the panels. Before you decide on a size, consider taking advantage of Idaho Power’s energy efficiency programs to help lower your overall energy use. Reducing your energy needs may allow you to install a smaller system and save money, and is also your greenest option. Information can be found at idahopower.com/save. The size of the system depends on many factors including the type of technology, the available space and how much energy your home or business uses. Your monthly electric bill shows your usage for the past 12 months and can be accessed through My Account, Idaho Power’s online account portal at idahopower.com/MyAccount. For customers interested in solar, visit idahopower.com/solar for calculators to help estimate system size and costs. How much energy does a system generate? The energy generated varies by the type of system and depends on such factors as technology, age, weather, location and directional orientation. Solar panels do not produce the same amount of power at all times of the year or all times of the day. They produce less in the winter due to weather and fewer hours of daylight. During the day, production will vary depending on the time of day, cloud cover and shading from nearby trees, roof pitches or other structures. PVWatts Calculator is an online tool developed by the federal government for estimating solar generation based on location, geographic weather patterns and system design. This tool is available at pvwatts.nrel.gov. According to PVWatts, one kilowatt of south-facing rooftop solar in southern Idaho will produce between 1,348 and 1,458 kWh per year. The average home in Idaho Power’s service area uses 11,400 kWh per year, so it would need a minimum of 8 kilowatts of solar to match nearly 100% of its electricity use for the year. To use PVWatts to determine the size system you would need, simply input your city, solar size in kilowatts (kW) and the calculator will estimate solar electricity generation by month and 12-month total. Compare the PVWatts estimate to your 12-month historical energy use, which you can find on My Account at idahopower.com/MyAccount. Tweak the kW in the calculator to find the size needed for your electricity use. If you decide to move forward with purchasing an on-site renewable generation system, a professional installer can help estimate a system’s monthly and annual solar generation. Be sure to compare the installer’s estimated solar generation with the information provided by PVWatts Calculator. Does Idaho Power offer any financial incentives or rebates for installing small-scale renewable energy systems on my property? No. However, there are federal and state tax incentives and loan programs that can help with financing on-site renewable energy sources. Upfront cash payments will have a shorter payback period than financing with a loan. The Idaho Office of Energy and Mineral Resources has information on financing options at oemr.idaho.gov. For Oregon customers, visit the Oregon Energy Department at oregon.gov/energy. The Database of State Incentives for Renewable Energy (DSIRE), funded by the U.S. Department of Energy, also lists incentives for renewable resources by state at dsireusa.org. When you are ready to proceed, find an installer. The Idaho Office of Energy and Mineral Resources has a list of installers. Idaho Power recommends getting three bids and verifying the installer’s estimates with the information provided above. On-site renewable generation is not an option for me. What other options are there for me to go green? You have options when it comes to renewable energy and using energy wisely. We have programs and tools to help you decide which Green Choices are best for you.